The field of STEM (science, technology, engineering, and math)is rapidly growing, with STEMdegrees in high demand. 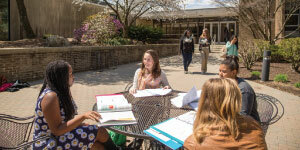 At Cedar Crest College, we realize the importance of promoting women in the field. • Cedar Crest students regularly pursue original scientific research projects—beginning as early as freshman year-—and present their findings at national meetings. • Every day, Cedar Crest STEM students work hands on with state-of-the-art instruments more commonly reserved for graduate students. • Full-time faculty members serve as one-on-one mentors and advisors with Cedar Crest STEM students. For the entire list of academic programs, visit cedarcrest.edu/academics. Here STEM means more time for independent research, more hands-on time with the latest instrumentation and equipment, and more time with experts and mentors. At Cedar Crest,students discover countless ways to love STEM—and even more ways to succeed. 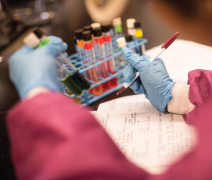 The programs offered by Cedar Crest’s Department of Biological Sciences emphasize critical thinking and independent investigation inboth the classroom and the laboratory. As students move toward upper-level course work, they have the opportunity to select a specially designedmajor (Environmental Conservation, Genetic Engineering, or Neuroscience), or they can continue to explore course work from across the discipline while working toward a degree in Biology. Cedar Crest also offers degrees in Mathematics as well as the chemical and physical sciences, including Biochemistry and Forensic Science. Thinking about applying for medical, dental, or veterinary school after graduation? The Health Professions Program is for you. It’s designed to provide students with the guidance, information, and assistance needed to pursue advanced medical education. Cedar Crest faculty members are passionate advocates for every student, and students get to know professors and advisors as colleagues and mentors. That makes a difference when they need good advice, a personal letter of recommendation, or a connection with opportunity. Our faculty members are active contributors to their fields of research. In fact, 70% of full-time faculty members hold a PhD or terminal degree in their area of specialization and are widely published in their fields.